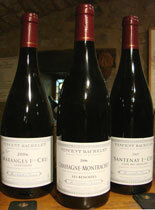 Winegrowing of 13 ha vines on the côte de beaune, mainly on Chassagne Montrachet and in Maranges, without forgetting Santenay, Meursault and Pommard. The owner Vincent Bachelet continues the paternal tradition of Bernard Bachelet. The wines are vinified and matured in splendid cellars of XVIIIe century, or offers an unforgettable spectacle. A beautiful occasion to taste this remarkable Chassagne-Montrachet premier cru Morgeot blanc 2010, with the notes of hawthorn and of smoked, all in mouth, fleshy, a wine of nice dyed, subtle, scented, charmer with the nose as in mouth, very quite well-balanced, of a beautiful harmony. The 2009, suave, very delicate, associate richness aromatic and persistence, dense in mouth, with persistent ripe apricot and hazel nut connotations. The 2008, intense, associating structure and smoothness, all harmonize some, a wine typified, fleshy, full, of persistent mouth, ideal on an bass with white butter. Excellent Chassagne-Montrachet rouge 2009, a wine of beautiful matter, with firm tannins, with the nose characteristic of red fruits, spices and very typified undergrowth, of good guard. After, Chassagne-Montrachet blanc, a wine with almond notes, fruits fresh and of honey, associating nervousness and suppleness in mouth, suave, of excellent evolution. Tasty Pommard Les Chanlins 2009, very scented (fresh red fruits, humus…), with this spice point characteristic of great successes of the appellation, very full and harmonious. The 2008, with intense scents of overripe fruits and spices, of very good mouth, fleshy and fleshy, with rich and harmonious tannins, continue his evolution. Gevrey-Chambertin 2010, with this nose of morello cherry surmûrie, is complex, all in mouth, of steady color, with quite well-balanced tannins, of a real and persistent richness, a wine which hardly opens. Beautiful Meursault Le Clos du Cronin 2010, all of structure and perfumes (broom, almond, peach), of finale complexes, full and persistent, a wine really elegant and charmer, of a beautiful potential of evolution, very traditional of the great successes of this beautiful vintage.